With the expanding presence of technology in today's economic market, the use of the Internet for buying, selling, and investing is growing more popular and public in nature. Statistical Methods in e-Commerce Research is the first book of its kind to focus on the statistical models and methods that are essential in order to analyze information from electronic-commerce (e-Commerce) transactions, identify the challenges that arise with new e-Commerce data structures, and discover new knowledge about consumer activity. 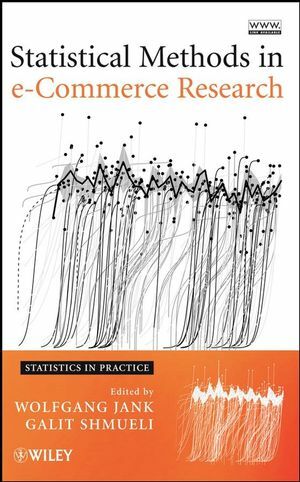 This collection gathers over thirty researchers and practitioners from the fields of statistics, computer science, information systems, and marketing to discuss the growing use of statistical methods in e-Commerce research. From privacy protection to economic impact, the book first identifies the many obstacles that are encountered while collecting, cleaning, exploring, and analyzing e-Commerce data. Solutions to these problems are then suggested using established and newly developed statistical and data mining methods. Finally, a look into the future of this evolving area of study is provided through an in-depth discussion of the emerging methods for conducting e-Commerce research. Statistical Methods in e-Commerce Research successfully bridges the gap between statistics and e-Commerce, introducing a statistical approach to solving challenges that arise in the context of online transactions, while also introducing a wide range of e-Commerce applications and problems where novel statistical methodology is warranted. It is an ideal text for courses on e-Commerce at the upper-undergraduate and graduate levels and also serves as a valuable reference for researchers and analysts across a wide array of subject areas, including economics, marketing, and information systems who would like to gain a deeper understanding of the use of statistics in their work. Section I: Overview of E-Commerce Research Challenges. 1. Statistical Challenges in Internet Advertising (Deepak Agarwal). 2. How Has E-Commerce Research Advanced Understanding of the Offline World (Chris Forman and Avi Goldfarb)? 3. The Economic Impact of User-Generated and Firm-Generated Online Content: Directions for Advancing the Frontiers in Electronic Commerce Research (Anindya Ghose). 4. Is Privacy Protection for Data in an E-Commerce World an Oxymoron (Stephen E. Fienberg)? 5. Network Analysis of Wikipedia (Robert H. Warren, Edoardo M. Airoldi, and David L. Banks). 6. An Analysis of Price Dynamics, Bidder Networks, and Market Structure in Online Art Auctions (Mayukh Dass and Srinivas K. Reddy). 7. Modeling Web Usability Diagnostics on the Basis of Usage Statistics (Avi Harel, Ron S. Kenett, and Fabrizio Ruggeri). 8. Developing Rich Insights on Public Internet Firm Entry and Exit Based on Survival Analysis and Data Visualization (Robert J. Kauffman and Bin Wang). 9. Modeling Time-Varying Coefficients in Pooled Cross-Sectional E-Commerce Data: An Introduction (Eric Overby and Benn Konsynski). 10. Optimization of Search Engine Marketing Bidding Strategies Using Statistical Techniques (Alon Matas and Yoni Schamroth). Section III: New Methods For E-Commerce Data. 11. Clustering Data with Measurement Errors (Mahesh Kumar and Nitin R. Patel). 12. Functional Data Analysis for Sparse Auction Data (Bitao Liu and Hans-Georg Müller). 13. A Family of Growth Models for Representing the Price Process in Online Auctions (Valerie Hyde, Galit Shmueli, and Wolfgang Jank). 14. Models of Bidder Activity Consistent with Self-Similar Bid Arrivals (Ralph P. Russo, Galit Shmueli, and Nariankadu D. Shyamalkumar). 15. Dynamic Spatial Models for Online Markets (Wolfgang Jank and P.K. Kannan). 16. Differential Equation Trees to Model Price Dynamics in Online Auctions (Wolfgang Jank, Galit Shmueli, and Shanshan Wang). 17. Quantile Modeling for Wallet Estimation (Claudia Perlich and Saharon Rosset). 18. Applications of Randomized Response Methodology in E-Commerce (Peter G.M. van der Heijden and Ulf Böckenholt).